Education: Lamar High School 1951-1953, University of Texas 1953-1957. • Texas State High School Champion in the 220 yard dash and second in the 100 yard dash in 1953. • In 1956 won the 100 yard dash at the Border Olympics, West Texas Relays, Kansas Relays, Southwest Conference Meet and finalist in the 100 and 200 Meter dashes in the U. S. Olympic Trials. Represented in the United States in Europe in July–August 1956. • In 1975 Bobby won the 100 Meter dash and tied the World Record of 10.7 seconds in the U.S. Masters in the 40-44 age division. • In 2005 he won the 100 Meter dash in 12.77 in the National Senior Games in Pittsburgh, Pennsylvania and set a new world record. • In 2006 Bobby won the 60 Meter dash in a world record time of 8.0 seconds and won the 200 Meter dash in 27.1 seconds at the National Masters Indoor Championships in Boston, Massachusetts. • In 2011 Bobby took gold in the 100 Meters winning in a time of 13.55. 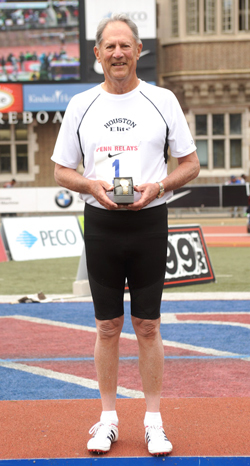 • In 2012 Bobby won the Penn Relays 100 Meters with a time of 13.67.